Def Leppard's 'Hysteria' album. Certainly their finest hour, and arguably one of the greatest Rock albums of all time, with over twenty million units sold. 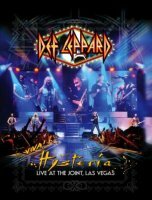 And though six or seven of the album's twelve tracks would become a mainstay of the groups live performances to this day, the whole album had never been performed in its entirety – until this year when the band took up an eleven night residency at The Joint in Las Vegas' Hard Rock Hotel to do just that, and this DVD package documents the show. After a brief segment of archive interviews, the show starts with guitarist Phil Collen high on a platform above the crowd peeling out the intro to 'Women', and he descends to the stage as the rest of the band join in, and they proceed to run through the whole album as it was originally sequenced, and staying completely faithful to all of the arrangements, sound effects and all. The band are on fire, with stunning vocal harmonies from Collen, fellow guitarist Vivian Campbell and bassist Rick Savage, while singer Joe Elliott also sounds great and seems to be thoroughly enjoying this resurgence in Def Leppard's popularity. The stage set is suitably impressive, and while not quite as elaborate as the 'In The Round' tour it's certainly less physically demanding. Raised platforms surrounding Rick Allen's drum-kit are used regularly, and huge video screens beam out footage of the guys performing, as well as things like the album's artwork, a montage of archive photos and karaoke-like footage of fans singing along to 'Pour Some Sugar On Me', while also paying tribute to much-missed guitarist Steve Clarke with footage of his solo spot from the original 'Hysteria' tour to precede 'Gods Of War'. Though it's one of my personal favourites, 'Love And Affection' isn't really a suitable show-closer, but an encore of 'Rock Of Ages' and 'Photograph' completely bring the house down. Also included in the package are two 35-minute opening sets that feature the band masquerading as fictitious tribute band Ded Flatbird (a name that came about when someone mispronounced Def Leppard). I haven't seen the video footage of these sets, but the audio alone is worth the price of admission, and delves deep into the back catalogue for some rarely heard gems. The first set opens with 'Good Morning Freedom' (which has only ever appeared as the B-side to 'Hello America') and takes in more golden oldies like 'Wasted', 'Stagefright', 'Mirror Mirror (Look Into My Eyes)' and 'Rock Brigade', then comes more up to date with their cover of Sweet's 'Action', 'Undefeated' and the excellent 'Promises.' The second set begins with 'On Through The Night' and a slightly awkward sounding 'Slang', before a complete run-through of what is basically Side 1 of the 'High 'n' Dry' album, from the awesome 'Let It Go' to the perfectly executed guitar instrumental 'Switch 625' – quite admirable when you consider that Phil Collen and Vivian Campbell weren't in the band when the original was recorded – and absolute heaven for long-standing Leppard fans. If you managed to get to one of these shows this is the perfect souvenir, for everybody else it's the next best thing.